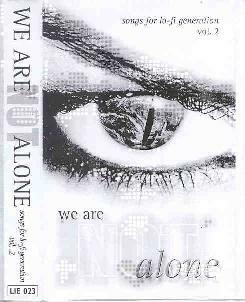 Various Artists - "We Are Not Alone: Songs For The Lo-Fi Generation, Vol. 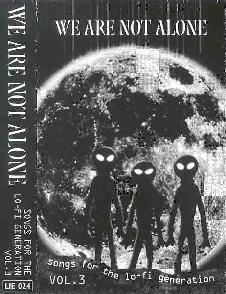 2"
Various Artists - "We Are Not Alone: Songs For The Lo-Fi Generation, Vol. 3"
From Sweden, the Moonbabies' entry is a dreamy instrumental guitar and electronic journey. Very nice. I'd like to hear some more extended works by these folks. From the UK, Lorna play ethereal but rough edged Shoegazer space rock with beautifully floating melodies. The band do a very good job of slowly building tension and intensity. Another nice one. I'd love to hear more. From Canada, Bluescreen bring to mind Porcupine Tree or King Black Acid with a dreamy female singer. An excellent song. Sauvie Island Moon Rocket Factory is a Portland, Oregon band that sound a bit like The Beatles, and even more like solo John Lennon. Nice guitar combos. Check out the review this issue of three of their cassette releases. Sunstorm is from Los Angeles and play dreamy space pop with traces of 70's prog rock and lots of cool freaky space bits. Would love to hear more from this band. Italians ONQ are a band we've covered before in Aural Innovations. I like their dark but trippy brand of psychedelia. From Australia, A Beautiful Machine play dark, slowly developing guitar driven space rock that gets mucho cosmically intense. Most excellent. They remind me a bit of SubArachnoid Space. Sharashka (from Illinois) and Mayumi (from the UK) are similar in that both play decent indie pop-rock with a spacey psychedelic edge and have very good female vocalists. And Swooner is a California combo that play dreamy Shoegazer space. A very nice blend of melodic song and whining guitars and pulsating drones. New Yorker Anthony Distefano plays electronic music that is floating but develops in interesting directions. See the review of one of his CDEP's this issue. Full Of Emptiness is from Los Angeles and play droney Shoegazer space that drifts along more than it develops but still has a pleasant sense of melody. w/trem (UK) is similar but with razor saw guitars. An interesting combination of harsh and ethereal elements. A good song too. From California, Tea play decent pop-rock with a dreamy atmospheric feel. From Britain, Aether Flux play dreamy space rock with a moody atmosphere, lots of cool bubbling cosmic sounds and a funky groove. I'd love to hear more. Hazel Bionic is from Australia and bring to mind a jamming space-psych version of early 80's U2. A strange analogy perhaps but that's how it struck me. A very good song and some excellent grinding trip guitars. Definitely a band to check out further. Girlinky is another UK band and play indie-pop along the lines of REM, but with a grungier edge, some punk influences, and some background freaky electronics. The singer even sounds like Michael Stipe. From Australia, The High Impedance play a floating style of slowly evolving sound sculptures. Anyone who has explored the musical underground will know Don Campau, creator of cool sounds and veteran California DJ. Don's contribution has a quirky dancey groove and cosmic spacey textures. New Zealander Michael J. Hex cranks out grungy indie-pop. Activity Set (Illinois) is similar but more on the dreamy side. Kitset is another New Zealand band who play very cool psych-rock that crosses early Rolling Stones with modern pop-psych bands like Olivia Tremor Control. I hope to hear more from these folks. Eta Carinae is from Australia and play a punky, grungy brand of garage-psych that I enjoyed. Autobot City play drifting Shoegazey grunge. From Belgium, the Circle Brothers contribute a chaotic mix of noise guitar, melody, and strange voice samples. New Waver from Australia is similar. These two bands close the set and are a bit more experimental than most of the other entries, though each offer up some good ideas. In summary, shed your fears of cassettes and the lo-fi sound because there are some excellent bands to check out on these comps. Both are recommended.